We will send an email to as soon as the product AK47 (AKM) org. Russia, used, deactivated assault rifle is available. Used condition, demilled according german law. Proof of age 18+ years required. 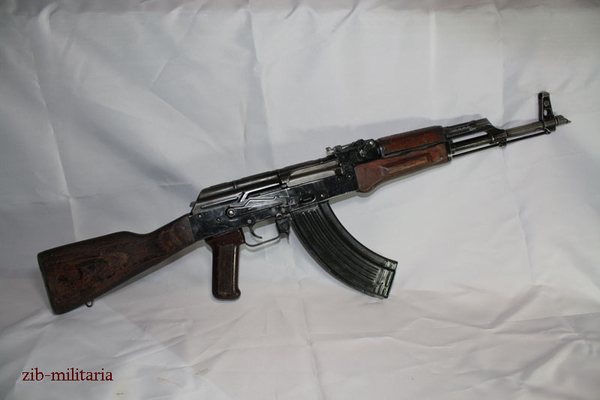 Following changes are done to all of our AK's: barrel drilled six times, steel pin set into barrel, bullet chamber welded, bolt head cut 45 degrees with firing pin channel welded, hammer/bolt catch fixed. Gut konserviert, Gebrauchspuren auf üblichen Stellen. Macken am Holzteilen, aber das sieht man schon auf Foto. Für das preis Top Ware! Ich freue mich schon für nachste Kauf! Danke!!! Great price fo original russian AK. Condition is just what I want from deactivated gun, well used but not abused. Für den Preis Top Qualität. Ich habe ein Stück Militärgeschichte gekauft, schade das sie nicht sprechen kann, hätte bestimmt viel zu berichten.